At Handi Medical Supply, we work very hard to do our best to enrich the lives of our customers in many ways. One of ways in which we do this is to provide you with easy to use web tools that make ordering each month a snap. In an effort to share some of these technologies that we have developed, we have created a series of training videos. Please take the time to watch them and we hope you too will be excited to use some of these new features. How to set up an account on Handimedical.com. Setting up an account on the handimedical.com website is very easy to do. Follow the simple instructions laid out by this video to get access to some really outstanding new features such as ording from Order History or using the Handi List to make a list of favorite products. Click here to watch this video. How to use Order History to EASILY reorder your products each and every month. 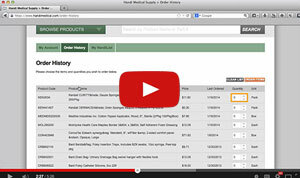 Using Order History to reorder your products every month is an incredible time saver. Our Order History app allows you to view a list of every product that you have ordered from us in the past 18 months, that is available to be sold online, and allows you to quickly re-order these products. It even asks you for updated insurance and physician information. Click here to watch this video. 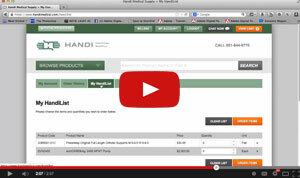 How to use the Handi List to save a list of your favorite products. The Handi List is a great way to save a list of your favorite or commonly used products without using a Handi List. This is a really helpful feature for many nurses as they can easily create a list of common products to order for their patients. 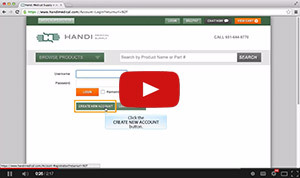 Click here to watch this video and learn more about how to use the Handi List. How to receive secure email from Handi Medical Supply. At Handi Medical Supply, we work very hard to secure your medical information. If we need to send you confidential or protected information electronically, we will do so using a secure email solution. When you receive such an email, instructions on how to access the content of your email will be sent to you. 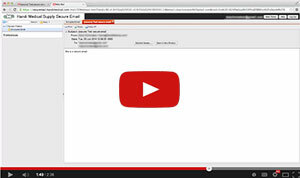 This video shows you how to set up and manage access to this secure email solution. You will not be able to set up a secure email account unless a secure email has been sent to you. Click here to watch this video.